Huge congrats Esther. Please would you mail your address over to me at mycreativespirituk@gmail.com so I can get your goodies off in the post to you. Todays layout was made using the new Mad Tea party papers by Marion Smith. I absolutely love the main paper with the hanging cutlery, cups and pots and wanted to create a layout around them and also use up the last of the Junque and Gems I had left too. I kept to the pink theme, added cut out elements from Roses R Red and Rabbit Hole paper, raised on foam tape for dimension. 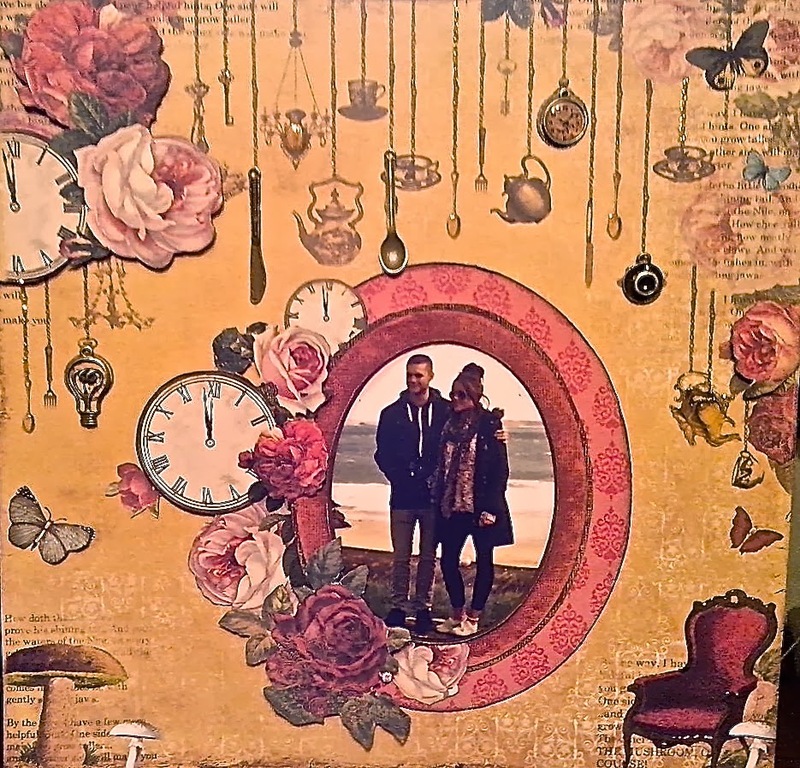 The mat around the pic of Jo and Siany (one of the Crafty Elfs twins) is cut from Cor'dinations card stock and the pink side of the Rabbit Hole paper. There's a little glitter and glossy accents on the chains, spoons pots and chair too. Another one for the album :-) A Jan DT project for Jones Crafts. Morning Clare, Congratuations to the very lucky Esther, enjoy your goodies. I am loving the Mad Tea Party papers, especially the one shown on your fabulous layout. I will have a look at your video now and check out the gorgeous papers. this is very beautiful Clare. I do so love the papers on this and fabulous layout. Your such a talent and have a sense of humor! Such wonderful qualities! Thanks for all the inspiration and chances to win!!! Love, love, love the album and the papers Clare!! Thanks for your inspiration.